Since launching we've had a lot of great feedback and excitement around how we're making communication easier. People are using CoughDrop in their classrooms for shared communication sessions, logging in on their computers to learn vocabulary sets remotely, using sharing features to connect communicators with distant family, and a bunch of other great use cases. We're really glad CoughDrop is already making such a difference (and love hearing stories, so please share!). But we're not done by any means, we want CoughDrop to keep getting better. One request we've been hearing is to make it easier to share private boards with multiple users. Previously if you authored a board or copied an existing board you could either make it public so anyone could see it, or make it private so only you and your linked supervisors could see it. Public boards are great for discovering new resources, and private boards keep sensitive information good and protected. But what if you wanted to share a board with a limited number of users? One teacher, for example, wanted to have a couple tablets spread through her classroom all connected to the same board set. Or a therapist might want to create a board set that she uses with multiple communicators. Sharing a board just got more flexible. Before the only way to do this would have been to either make everything public, or have everyone use the same login. 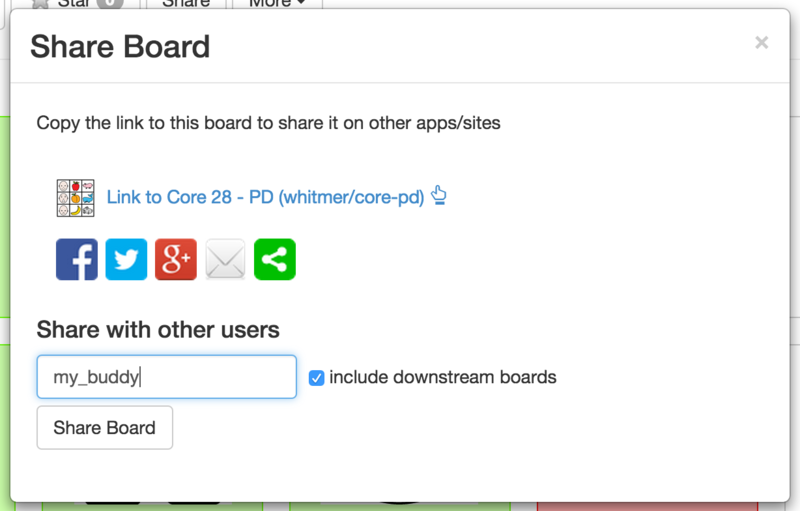 Neither of those were ideal, so we've added a new option to the "Share" button on CoughDrop boards. If you're the board author or have sharing permissions, you can enter the usernames of communicators you would like to have access to the current board. You can also automatically apply that sharing to any additional boards linked to from that board, so you don't have to go to each board and share over and over again. We hope this makes it easier to use CoughDrop effectively and securely. Thanks again to those who shared their experiences and helped us find the need for this change. We aren't kidding when we say we love getting feedback, so please keep it coming!